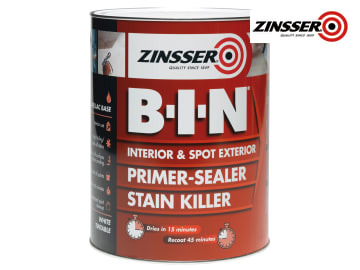 Zinsser's B-I-N® is the ultimate shellac-based primer, sealer and stain killer. 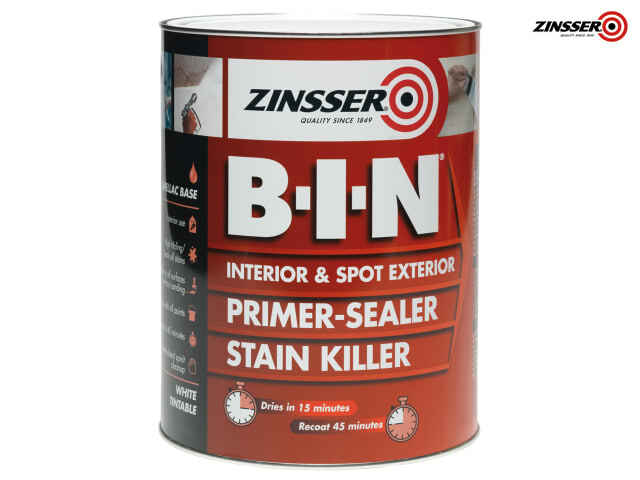 It is perfect for use on interior surfaces and spot priming of exterior surfaces. B-I-N® permanently blocks every kind of odour (from smoke and fire damage to odours from pets and nicotine). Its dried film is non-toxic and hypo-allergenic, and it may be used in areas where incidental contact with food items occur. The primer is white in colour, but can also be tinted to mid-tone colours. It can be applied via an airless sprayer, brush, conventional sprayer or roller. Perfect for interior ceilings, walls, doors and related paintable surfaces and spot priming on exterior metal, trims, PVC and wood. Hard dry: 1 - 3 days.